Wow! This is a stunning amount, and I was curious enough to see if I could find some more information about organ donation in Australia. There are so many statistics and so much information available on the Government website http://www.donatelife.gov.au, so I have taken what I feel are the most relevant and interesting to me as a parent of a child who will one day be put on a transplant list to undergo a heart/double lung transplant. * The majority of Australians are generally willing to become organ donors (80% of the population) and tissue donors (78% of the population); however, less than 2% of people who die in hospital will be eligible to donate their organs. Many more people can become eye and tissue donors as tissues can be donated up to 24 hours after death, regardless of where death occurred. Each one of us has the chance to save lives. Of the approximately 1600 people on organ transplant waiting lists, sadly many will die waiting for the gift of a heart, liver, kidney, lung or pancreas transplant. We need to discover for ourselves, the facts about organ donation and to make and register our own decisions about donation and to make sure that we all know our family’s wishes as well. In Australia, our families will always be asked to confirm our donation wishes before any donation can proceed. You can register as an Australian organ donor by calling 1800 777 203, visiting a Medicare Service Centre, or your local GP may also have registration forms. 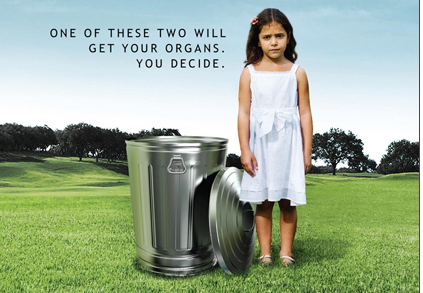 You must be 16 years or older to register your organ donation decision. Many Australian’s may have previously registered their decision elsewhere, perhaps on your driver’s licence, however it is still extremely important that you register on the Australian Organ Donor Register. It is the only national register and details can be linked to your Medicare number. Almost everyone can help others through organ and tissue donation, and while your age and medical history will be considered, you shouldn’t assume you’re too young, too old or not healthy enough to become a donor. If you are a member of a church, and you’re not sure if your religious belief’s support organ donation, please talk to the leader of your Church to help you in your decision making process. Did you know that you can also donate a kidney or part of your liver now, while you’re still alive? This is, however, usually restricted to those wanting to transform the life of someone you know. Less than 2% of people who die in hospital will be able to donate their organs, so it is very important to identify all potential donors and support their families whilst they make the decisions about donation. Many more people can become eye and tissue donors as tissues can still be donated up to 24 hours after death. The way a person dies determines whether or not they are able to donate organs and tissues; a person who has been declared brain dead and are being artificially ventilated in hospital may be able to donate organs also. Brain death occurs when blood circulation to the brain ceases and the brain stops functioning and dies with no possibility of recovery. Tests are performed by two independent and appropriately qualified senior doctors to establish that brain death has occurred. Organ donation is less common after a person’s heart has stopped beating, referred to as cardiac death; the circumstances behind these deaths means there is usually no chance to discuss donation with the person, leaving the decision to the family. Letting your family know of your wishes regarding organ donation makes it so much easier if they ever have to make this very difficult decision. There is a lot of support available for families having the make these hard decisions through the Intensive Care Unit team caring for you as well as the DonateLife Agency Donor Coordinator and Donor Family Support Coordinator. They will give your family as much support as they need, both during and after the decision to donate, regardless of their decision, and if the family wishes, they can be provided information on the outcomes of the donation by the DonateLife Donor Coordinator, and they can also receive information on how to write anonymously to the recipients. Families making this decision also have access to free bereavement counselling. More than 30, 000 Australians have received organ transplants since 1965; over 900 organ transplant operations are performed each year. Many more tissue transplants/grafts are performed, of which about 1500 are corneal transplants. Australia is the world leader for successful transplant outcomes, for both survival rates of recipients and in the number of organs that are able to be transplanted from each donor. Organ transplants dramatically improve the lives of recipients, allowing them to lead active and healthy lives where once this was not a possibility. Friends and family of recipients also see a huge difference in their own lives, watching their loved ones free of the constraints of their illnesses. In Australia, when a person is put on a transplant waiting list, it means they have ‘end-stage organ failure’, and all other possible treatments have failed. Waiting times depend on whether or not there is a suitable donated organ available, and the allocation of organs through the waiting lists (there are waiting lists for each transplantable organ – heart, lungs, kidney, liver and pancreas). A person is usually on a waiting list from between six months and four years, however if there is no suitable transplant available, it could be even longer. Organs are allocated to recipients in a process that is not based on race, religion, gender, social status, disability or age (unless age is relevant to the organ matching criteria); it is a fair, equitable and unbiased process. The waiting lists are managed by different groups depending on the organ involved and the state or territory where the recipient lives. Allocation is a complex process and there are extremely strict guidelines about the allocation of organs and tissues in Australia, and these guidelines have been developed by The Transplantation Society of Australia and New Zealand (TSANZ) - Organ Transplantation from Deceased Donors: Consensus Statement on Eligibility Criteria and Allocation Protocols. * Kidneys are matched by blood group and tissue compatibility through the computerised National Organ Matching Service, which is administered by the Australian Red Cross Blood Service. Up until I started researching organ donation in Australia, I was under the impression that having it on my driver’s license would be enough. As soon as I found out that I should be registered on the Australian Organ Donor Register, I made a quick phone call and both Nigel and I were registered as donors while I was still writing this blog. I urge you all to do the same. It’s the difference between life and death for many of us.